Shannon Amidon was born and raised in San Jose, CA. 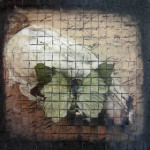 She is a mixed media artist using alternative process photography, encaustic and paper ephemera as her main mediums. Her subjects often involve objects the artist has found in nature or collected in her travels such as: seed pods, insects, botanicals, fossils, feathers, bones, and vintage paper ephemera. Using these items and mediums, Amidon creates unique pieces that explore the beautiful, repulsive, and mysterious sides of natural history. 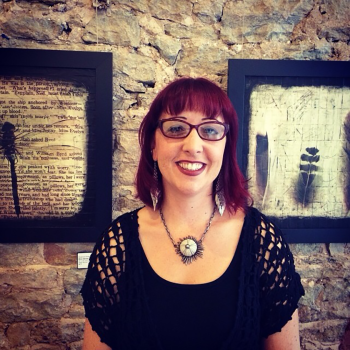 Shannon’s artwork has been exhibited worldwide with emphasis on the US West Coast. In 2011 she was named the Arts Council Silicon Valley Artist Laureate, receiving a Fellowship Grant in photography. She was also the recipient of an Eco Art Grant and studio make-over from the Art Inspector part of the Zero One Art and Technology Network. In 2013 Amidon was one of eight artists chosen to create a large, 400lb, 5ft x 6ft public art heart for San Francisco General Hospital Foundation. Amidon has been an artist in residence at the HerhÃºsid House Artist Residency in Iceland as well as the David and Julia White Artist Colony in Costa Rica. She is active in her local arts community contributing her time, knowledge and art whenever possible. She is also involved in arts education outreach for children and young artist mentoring through the SPARK program. The fellowship was validation that I was on the right path. It gave me confidence and meant all my hard work was paying off. It allowed me to attend an artist residency in Iceland. There I was able to really dive into my work, create and reflect. Without the fellowship I would not have been able to take advantage of that opportunity. Be professional and do not flake or talk negatively about others, the art world is smaller than you think. Work, work, work and work some more. Being an artist is hard work and you get out of it what you put in. Be bold, true to yourself and believe that the world is a beautiful place and you deserve to be happy and successful.